After the success of the very first overseas ‘Mobile Disco’ in Bali recently, Carl and Eric are excited to announce the Australian & New Zealand tour dates for November 2018 featuring special guests: Cece Peniston (Finally) & Robin S (Show Me Love). Carl & Eric will be doing what they do best! Digging deep through their extensive record collections and picking out their favourite soul, funk and disco tracks that they were brought up with and tracks that have influenced them over the years. It’s a known fact that they have many gems in the archives! ‘Mobile Disco’ began in Melbourne, Australia with 150 of Carl & Eric’s closest friends. It’s gotten bigger each year with more friends & jazz, funk and disco loving fans coming along for the ride. 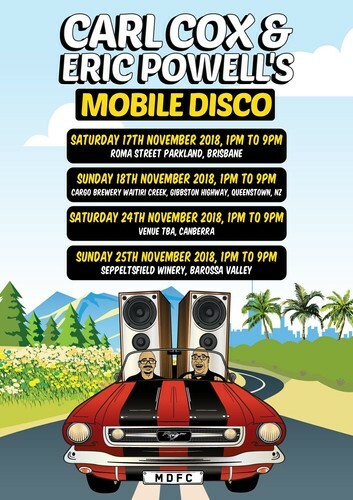 ‘Mobile Disco’ is now a ‘Must Attend’ national tour playing to sold out boutique shows at some of the most picturesque locations across Australia. They embarked overseas for the first time, grooving Bali in fine form only a couple of weeks ago and will be also heading to New Zealand this November. Both Carl & Eric will be entertaining the crowd from the start of the day til the end and are also excited to announce that special guests: Cece Peniston & Robin S will be performing live on stage. Cece Peniston and Robin S come from that amazing house music sweet spot of the 90s. These diva vocalists arguably have the two most iconic/classic genre defining vocal house tracks ever written. So get those disco shoes ready, this is one Mobile Disco you won’t want to miss!